Inspired by falling leaves along the famed Champs-Élysées, the newly designed Champs-Élysées petite vase is available in Gold Luster. Horizontal bevel cuts on the outside and vertical bevel cuts on the inside for a brilliant optical effect. Maximizes the unpredictability of perception. Made of lead crystal. Hand wash. 5.875"T. Made in France. Handcrafted century marble vase with golden veining. Perfect for floor and table use. Color striations and golden veining of each piece will vary. 5"Dia. x 20"T. Imported. Handcrafted glass vase with base plated in champagne gold with an antiqued finish. From the Composition Collection. 5.5"Dia. 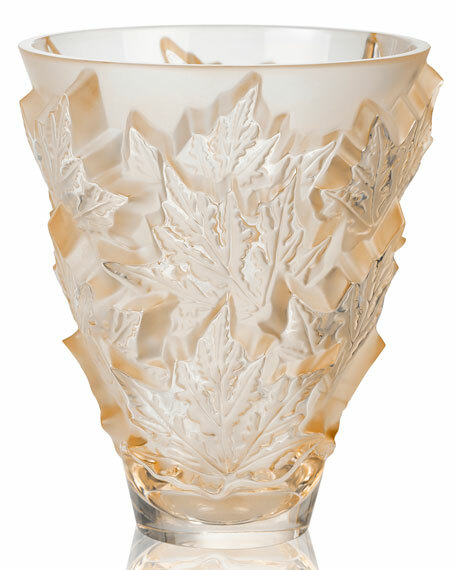 x 11"T.
Handcrafted glass vase with base plated in champagne gold with an antiqued finish. From the Composition Collection. 5.5"Dia. x 11"T. Imported.